Ok, I’ll admit it, I know I’m sort of a big data nerd and not everyone is, so I may be in the minority when it comes to the attention I give, and time I devote, to market data, stats, trends and the like. However, while not everyone wants to study this stuff, anyone in the market to buy or sell real estate either needs to be up to date on what is going on in the market in terms of price (and the other stuff I mentioned) or be represented by a real estate agent that is. Otherwise, without this information or, worse yet, with bad information, home buyers and sellers can make some really bad decisions. There is a lot of “bad” data out there and it can hurt you! When I started in the real estate business, way back in 1979 and the age of 18, it was very hard to get much data on home prices, sales, etc, heck, it wasn’t even easy to find out what was listed for sale. Today, largely a result of the internet, things are much different. There is plenty of data and information available to home buyers and sellers today and it’s easy to find. The hard part today isn’t getting the data and information, it’s getting good, accurate and relevant data and information. You don’t have to spend much time online, whether on social media sites, real estate websites or even “news” sites, to discover all sorts of inaccurate, incomplete, dated, useless and conflicting data and information. For example, in the past week, I saw reports, even from people in the real estate profession in St Louis, indicating home prices declined last month from a year ago to the tune of about 3% or so, but I don’t believe that is the case. Bear with me and keep reading and you will see why I say this as well as what I think is accurate with regard to St Louis home prices. Usually the source means well and the data is believed to be accurate, but…. With regard to real estate, I think most of the data published on real estate sites, social media sites, etc by real estate agents as well as others in the industry, is believed by the person putting it out there to be accurate, the problem is it often is not. The problem is, without really digging into the source of the data, or examining what criteria was used to compile the data or report, people are often passing along information they are just assuming to be accurate but often is not. 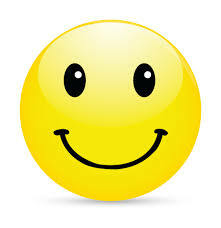 So, where can you find good, accurate and relevant information and data on the St Louis real estate market? 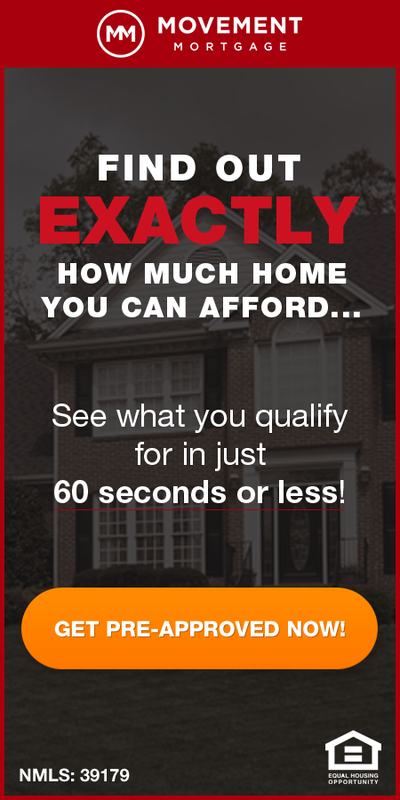 You are actually at one of the best sources for St Louis home prices, home sales and other relevant data and information, StLouisRealEstateNews.com! Of course, since I’m writing this, I’m partial, but in all seriousness I can say I have personally spent years trying to figure out the best way to get the best, most timely and most relevant data for the St Louis housing market and feel I have accomplished that goal. After trying data and reports from several companies that aggregate data to generate reports for the St Louis housing market, each time running into issues with the data, either inaccurate data, incomplete or missing data, etc I gave up on that. Being a REALTOR, I have access to the MLS which is really the best source of information and data for St Louis area home prices, sales, etc, so I turned to that as a source of information for our agents and clients. However, I realized there were still issues with limitations on how data can be retrieved, the types of data available, how it can be presented and so on, so I set out to find a better solution. 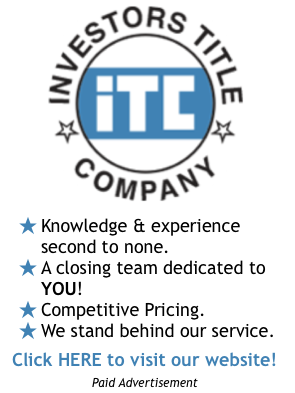 This led to our firm, MORE, REALTORS, developing it’s only proprietary software which would compile St Louis housing data from the best sources and report it in ways that would be timely, relevant and useful to our agents and clients. It is from this software where most of the charts, tables and other reports and data you see here on StLouisRealEstateNews.com come from. Let me begin by saying for the purposes herein, I’m focusing just on the St Louis City and St Louis County (combined) market and then only on home prices and not condo prices (there were nearly 6 times as many homes as condos sold in the past 12 months) nor a combination of home and condo prices. 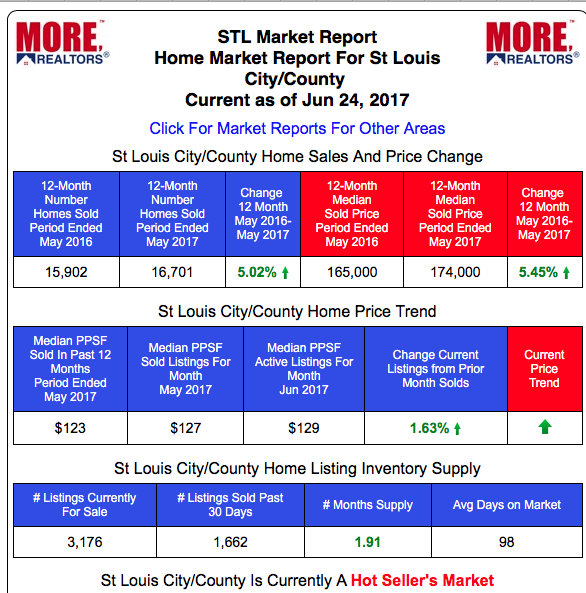 As the chart below shows, the median price per foot (a more accurate way of looking at home prices than just the gross sales price) of homes sold in the city and county of St Louis during May 2017 was $126, and in May 2016 is was $127 so a very statistically insignificant decline of 3/4 of one percent. See the difference in data? As I mentioned earlier, there were reports this week that home prices for this same area and time period had declined over 3%, a decline in price of nearly 4 times more than what I am saying it was. Why the difference? Well, I have not seen the data behind the reports out there that indicated the large decline in home prices but I think it is a result of two things: One, the pricing data is a combination of home prices and condo prices, which would be fine if that is what you said it was, but it is being used to discuss “home” prices and two, the data is based upon the median price homes sold for without regard for the size. My data is strictly home sales with condos excluded and is based upon price per foot which is more accurate. For example, look at my chart below again and you will see the median size of home sold in May 2017 was 1,575 square feet and in May 2016 it was 1,608 square feet. So, if you only look at the gross sales price, and don’t take into account the fact that there were generally smaller homes sold last month than a year ago, you miss a big part of the picture. To get a much better picture of the St Louis real estate market and, specifically, home prices, we need to look at a 12-month period. The table below does just that. Like the chart above, it reflects data for homes sold in the city and county of St Louis and shows that, for the 12-month period ending May 31, 2017, the median home price was $174,000, an increase of 5.45% from the prior 12-month period when the median price was $165,0000. Hmm…where is that decline in home price people are talking about? But wait! I said price per foot is a better way to go and that is true but not the only thing to look at. There are several pieces of data that need to be looked at and then a conclusion drawn from all of it. But, look at the price per foot data on the table and you will see that the median price per foot for the most recent 12-month period was $123 and for May 2017, the last month of that period, $127. Couple that with the median price of current listings of $129 per foot and I don’t see a price decline nor a trend pointing that direction. Finally, lets drill down just a bit further and remove “distressed sales” (foreclosures, bank-owned real estate and short-sales) from the data so we can get an even more accurate depiction of the actual retail market and home prices without the impact of distressed sales….read on for this.. The chart below is the same as the chart I used earlier only I have removed the distressed home sales, so this chart just reflects homes sold in the city and county of St Louis that were not short sales, foreclosures nor owned by the government or banks. When you look at the price per foot for homes sold in May 2017 you will see it is $132, the exact same as in May 2016. See what a difference the right data makes? You’ve come this far so I would continue and read my closing below the chart. I didn’t set out to write this long of article but think that is a topic that is extremely important to real estate agents, home buyers and sellers so it’s worth the time. My goal here wasn’t to bash anyone that, with good intentions, is sharing data that isn’t necessarily accurate or relevant, but to show the importance of good data as well as to know and understand the data before you make financial decisions based upon it. Look how different of a picture you get from the reports of home prices declining over 3% from a year ago, to the reality that they are up over 5% and, even in a year-over-year comparison for just May, they are about the same as a year ago. A buyer basing decisions on the wrong data is probably going to be disappointed by missing out on homes by making too low of offers and a seller that may base a pricing decision on the wrong data is going to end up selling too low and leaving money on the table. One of the Bible verses I often quote, and have taught to my kids, is Acts 17:11 which, to give the Dennis paraphrase here, says to take in information from those teaching you or sharing it with you but then, afterward, go to the source of data to find out whether it’s true. While the verse is referring to the Bible and teachings from it, I apply it to everything. I think it’s a good idea for all of us to listen, but then go find out for ourselves whether what we are hearing is accurate or not. I invite you to do that with everything I have discussed here as well. I make mistakes and our software and systems, while good and throughly tested, is certainly not flawless so there is always room for improvement. The Importance Of Accurate St Louis Home Price Data for Sellers and Buyers- Prices Down 19%?? Or Up 8%? ?